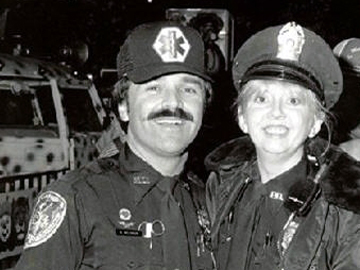 Susan Grappe Cambre, better known as “Deputy Susie,” is a colorful and accomplished character, and that rarest of public figures—a Deaf policewoman. She understands the destructive power in the statement, “You can’t!” because she spent years battling that attitude. Deputy Susie (thus called because of her high-profile work with children) is an investigator and Director of Elderly Services and Community Education for the Tangipahoa Parish Sheriff’s Office. (Tangipahoa Parish is in southeast Louisiana, just south of the Mississippi border. Its largest city is Hammond, and because of its proximity to New Orleans and Baton Rouge, is one of the state’s fastest-growing suburbs.) Her specialty is educating the public through presentations, and elderly people’s rights. Born deaf, Susie Grappe grew up in New Orleans, Louisiana. Her paternal grandmother, Lucille Koger of New Orleans, was a well-known religious artist. The family spoke Cajun French, and experimented with innovative approaches for raising a deaf child. She was attending Northwestern State University in Nachitoches and majoring in Art Therapy when her life took a dramatic turn. "I first got into law enforcement because somebody broke into my house. Because I didn’t have any way to call for help.” She had no way of communicating directly with the emergency dispatcher. “"So I learned that we didn't have the same rights, we didn't have the ability to call for help. I learned that we had to teach those professionals, we have to teach people what we want.” That traumatic experience made her determined to change the system from the inside, to benefit the Deaf community, and to make the New Orleans district a better, more equitable place not just for Deaf residents but for everyone. Becoming a police officer was a struggle that took years. She credits TPSO Sheriff Daniel Edwards, one of her mentors, for being open-minded and supportive. Deputy Susie has worked in almost all law-enforcement capacities, from her very first surveillance duty in the Special Operations Division, to Patrol, Child Abuse, Domestic Violence, LASER (Land Air Sea Emergency Rescue), and Community Relations. She has a knack for being in the right place at the right time. She has received certifications in a wide range of special interests. Throughout the years, she has worked special assignments with most major law-enforcement agencies and school systems. and continues to assist many departments with specialized situations and training. She frequently teaches at various police academies, emergency rooms, district attorneys’ offices, and school-board-personnel programs nationwide. She has written, designed, and presented 42 award-winning safety and awareness programs for children, families, elderly, and professionals, such as Project See and Save for the elderly and Red Light, Green Light for young children. Don’t Come a-Knockin’ is a new one. And she has been a local children’s TV and radio personality on WWL-TV, New Orleans’ CBS affiliate, and KSLU-FM, Hammond’s PBS radio station. Every Sunday night for four years she could be heard on KSLU’s A Heart of Glass, a talk/counseling program for teens. She appeared regularly on national children’s shows such as Bozo the Clown, Mister Rogers’ Neighborhood, and Sesame Street, and been involved with New Orleans TV and radio for 25 years as writer, producer, and on-air personality. She also founded and directed the Louisiana Hearing Dog Program in Hammond. She has also been a columnist and feature writer for the Hammond Daily Star. Her freelance articles have been published in several magazines. And she’s a skilled photojournalist. Her photos have appeared in the Daily Star, Baton Rouge Advocate, and New Orleans CityBusiness. She has provided numerous seminars, presentations, professional training, and in-service programs throughout all states (including Alaska and Hawai’i) and abroad. She has appeared on many national television broadcasts and has been the subject of many print-media profiles. When Hurricane Katrina hit Louisiana on August 29, 2005, Deputy Susie was living in St. Bernard Parish, teaching at Nunez College, and, semi-retired from the Sheriff’s Office, was working special assignments and serving as supervisor of the Total Community Action, Neighborhood-Community Center in New Orleans. Katrina demolished her home and community. She and her husband Lloyd, a well-known musician, drummer for a jazz band, and teacher, volunteered to work emergency operations on the Gulf Coast for several months, then worked at Red Cross shelters in Alabama, Mississippi, and Louisiana until November 2006, when they finally reached Houston. There she began work as an archivist with the Surviving Katrina and Rita project at the University of Houston and U.S. Library of Congress. She was honored by President Reagan twice (and successfully encouraged him to purchase hearing aids), and has appeared on a number of nationally televised programs, among them Good Morning America, Hour Magazine, ABC Nightline, The Today Show, and Donahue. She was a special guest of First Lady Nancy Reagan and a keynote speaker for the White House Conference on Drug Abuse in 1990 and has provided seminars, entertainment, and presentations worldwide. She has won countless national awards, including the President’s Child Protection Award and the Freedoms Foundation Award. She received one of the only two prestigious Neighborhood Knight Awards given by New Orleans Mayor C. Ray Nagin. She’s now a nominee for the 2014 Oticon Focus on People Awards. She has received numerous commendations in law enforcement and is a recognized expert in a number of fields, including child protection, domestic violence, child abuse, elderly crime/people with disabilities, and family/professional safety. She has singlehandedly organized and orchestrated major art shows, exhibits, and at least 50 charity-fundraising events featuring “big name” performers, celebrities, and special guests. She has shown her own work at the New Orleans Museum of Art in a Women in Photography International exhibition and various local art galleries and special exhibits—e.g., her photography show Deaf Voices Singing Praise. A Master’s in Communications has been added to her other advanced degrees, one in Social Work and one in Business Administration in Training and Development. She continues to develop new projects for her community and schools. Her next challenge will be to pursue a doctorate in Religious Counseling. She has performed her distinctive form of ballet before many dignitaries and heads of state throughout the world. Looking over her career in law enforcement, she told David Lippman, “It’s been the best and the worst. But I am so blessed. So, so blessed to have worked with some of the most fantastic people in the world, who genuinely want to meet the needs of everybody." * David Lippman, “Deaf sheriff's deputy inspires through determination, character,” WGMB (Fox 44), Baton Rouge, September 13, 2013 (http://www.fox44.com/news/deaf-sheriffs-deputy-inspires-through-determination-character). † “Second lining” is a distinctive New Orleans parade tradition. The formal marchers and brass band are the first line; onlookers who join the parade for the joy of dancing to the music (which they do exuberantly) are the second line.